Format VideoPosted in Videos | Tagged Evergreen Speedway, Ford, Ford Racing, Gumout, Nitto Tire, Round 5, Vaughn Gittin Jr. Format VideoPosted in Videos | Tagged Ford, Ford Racing, Gumout, Nitto Tires, Vaughn Gittin Jr. When Formula Drift driver Justin Pawlak was planning his engine build for the 2015 season, he took a different route than the typical pushrod “Sprint Car” engine he ran in the past. Pawlak liked the idea of the high RPMs and the supercharger power compatibility that the Ford Performance 5.0L Coyote Aluminator engine offered. During the offseason he worked with the engineers at Ford Performance and Roush Performance to build a Aluminator-based 800+ horsepower bullet. While he experienced a few tuning issues during the first two rounds of the season, Pawlak enjoyed a breakthrough at the most recent Formula Drift event in Monroe, Wash., and scored a third-place finish. The Ford Performance Aluminator Short Blocks serve as a strong foundation for the enthusiast that wants to spec and finish a Coyote build to their particular application and needs. Ford Performance Engineers have taken care of the toughest part of building a new engine by designing a strong and durable short block that offers a wide range of power possibilities. There are two versions of the Aluminator Short Block available – the 9.5:1 compressions Aluminator SC for boosted applications – or the11.0:1 Aluminator NA for naturally aspirated builds. Aluminator Short Blocks feature stronger Manley® H-Beam connecting rods and Mahle® hard anodized forged pistons to support serious power. And every Ford Performance Aluminator Short Block is precision internal balanced and hand assembled in the U.S. with performance clearances. Ford Performance offers a number of components to finish the build, including the simple-to-install Controls Pack to get it up and running in just about any vehicle from Late Model Mustangs to resto-rods to classic muscle cars to street rods. Looking for an adrenaline rush? Gumout has what you’re looking for. 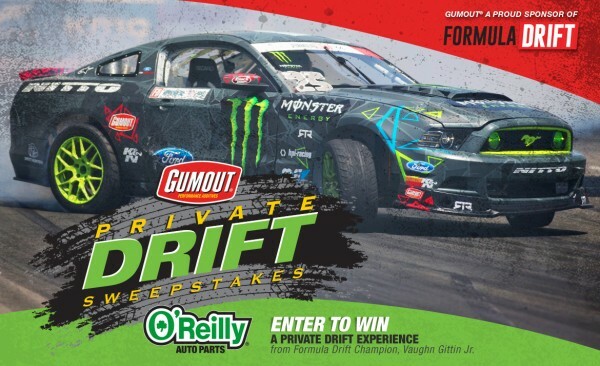 You could win a Vaughn Gittin Jr. private drift experience in Las Vegas, NV! One grand prize winner will have the unique opportunity to go on a VIP drift experience with one of drifting’s most iconic figures – Vaughn Gittin Jr.! Grand Prize winner and his/her guest will be sent on a trip to Las Vegas including airfare for two (2), hotel accommodations for three (3) nights, $500 spending, a private drifting experience and more! Posted in Contests, FD News, Featured | Tagged Ford, Ford Racing, Gumout, Monster Engergy Drink, Nitto Tires, Vaughn Gittin Jr.